GCU students, staff and faculty get their Lopes Up at everything from basketball games to concerts to employee orientations. Jim D’Apice felt assaulted by the barrage of “Hook ’em Horns.” He needed a defense mechanism. A proud and loud Texan who lived with D’Apice in GCU’s dorms reminded him constantly about the Longhorns as if they both attended the University of Texas. The antagonist flashed the hand gesture, pointer and pinky arrogantly spiked upward, as if he were making a political statement. It drove D’Apice and his pals crazy. They were in Phoenix. Not Austin. They were Antelopes. They ought to show some ’Lopes pride, he thought. As the sports arguments escalated, D’Apice scrunched his fingers together and contorted his hand in a way that gave him his own horned animal to fight back with. His thumb, middle and index fingers met together in a tight point to resemble a snout. He kept his pointer and pinky fingers angled low across the top of his hand, forming the “little bitty horns” of an antelope. That was 1996. 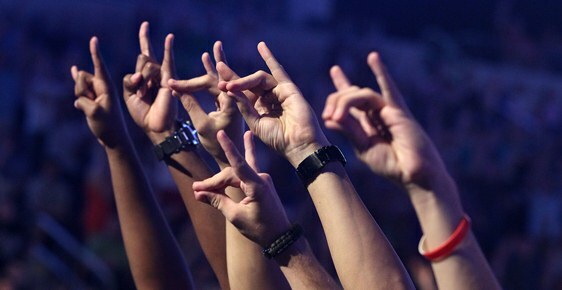 The ’Lopes Up symbol was born on campus in a way few students or staff can say they remember. And it was slow to catch on. “It was a lot of eye rolling and people shaking their head at me, and then people would do it almost ironically, like a joke,” said D’Apice, who graduated from GCU in 2000 and earned his doctorate in physical therapy from A.T. Still University. 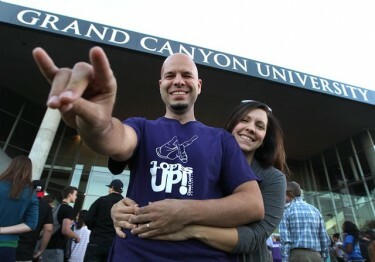 Jim D'Apice, who created the 'Lopes Up gesture, poses with his wife Nicole in front of GCU Arena. ’Lopes Up has since evolved into a GCU community phenomenon. Students flash it not only at basketball games at GCU Arena or at other campus sporting events, but also as a general matter of school pride similar to Arizona State University’s three-fingered pitchfork. New employees learn the symbol at orientation. A pair of GCU film students created ’Lopes Up hip-hop videos. But other than the color purple, if anything says GCU at basketball games, it’s the sight of cheerleaders and a raucous student section encouraging fans to get their ’Lopes up during free throws. Fans also can buy ’Lopes Up foam fingers and T-shirts. But the sense of team spirit and community pride resonates in the simple hand gesture. “I think the traditions that are started by students and grow from there are the best ones and the ones that last,” said Dan Ballenger, GCU’s athletic spirit coordinator, who initiated the University’s student sections at sporting events as an undergrad in 2009. The hand gesture that symbolizes GCU’s beloved Antelope mascot seems to have some students confused, according to ’Lopes Up creator Jim D’Apice. He said he still sees students missing a key step with the “itty bitty horns” created by the pinky and pointer fingers. GCU needs to“bring back the purity,” D’Apice joked. After all, we can’t have our ’Lopes Up sign looking anything like the Texas Longhorns, or the heavy-metal rock-out sign. This is not Austin, Texas. And this is not an Ozzy Osbourne concert. Step 1:Curl your hand together as if you’re shaping an “O” with your pointer and thumb together. Step 2:Scrunch your middle fingers together and bring them to a point with your thumb. These three digits together create the lil’ ’Lopes snout. Step 3:Now here’s the key part. Use your pointer and pinky for the ’Lopes horns, but don’t let them get too wide or they’ll resemble the spread-horned, wide face of a Longhorn. Rather, you have the distinguished little head of the mighty Antelope. Step 4: Your ’Lopes are up! Display them with pride! they barely recognize from their days of watching poorly attended ’Lopes basketball games at Antelope Gym. “I truthfully didn’t think anyone did it until about five years ago when we were back on campus,” D’Apice said about the annual game he catches with Hodges. Hodges, who graduated in 2001, helped spread the word around athletes and coaches — but to mixed reviews. He wondered if ’Lopes Up would just fizzle out. While Hodges envisioned GCU’s student section aspiring to be like the one in Duke University’s Cameron Indoor Stadium, those days of ’Lopes hoops were “brutal” with such low attendance, Hodges said. The vibe at GCU Arena, currently hosting its second basketball season, is far more intense these days. By 2009 students, especially those in the Canyon Crazies section, had made ’Lopes Up part of every basketball game at the old Antelope Gym thanks to cheerleaders and some superfans. 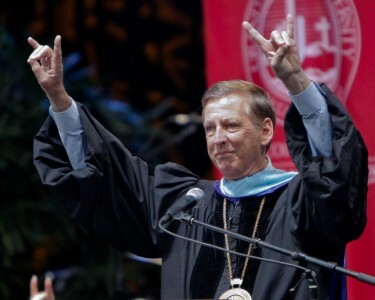 GCU President and CEO Brian Mueller gets his 'Lopes Up during graduation ceremonies in May. Taylor Griffin, a GCU freshman at the time, said he initially approached a cheerleader at a game with the idea of starting a chant to boost players’ confidence during free throws. 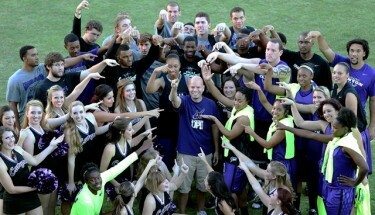 Cheerleading coach Emily Stephens and her team worked with some of the more involved student basketball supporters to innovate the “1-2-3 … ’LOPES UP” chant, where the crowd does the sign while GCU players are preparing to shoot from the foul line, saving distracting pompon shakes for the opposing team. The chant has become a regular practice at the new Arena. Griffin also said drawings of the ’Lopes Up hand symbol, emblazoned on T-shirts and flags across campus, have helped the cause. Oh, it’s big. It’s as big as an Antelope with little bitty horns. And at GCU, that’s a beast. Contact Michael Ferraresi at 602.639.7030 or michael.ferraresi@gcu.edu or Cooper Nelson at 602.639.7511 or cooper.nelson@gcu.edu. Thanks, now I know where the “Lopes” comes from. I am a recent GCU grad student and live in Texas where Texas A & M (Aggies), U.T. (Longhorns) and my undergrad U.T.S.A. (Roadrunners-2009) are the most prevalent symbols I see on shirts and hats. I often get asked what “Fear the Lopes” means when I wear my “Fear the Lopes” cap.